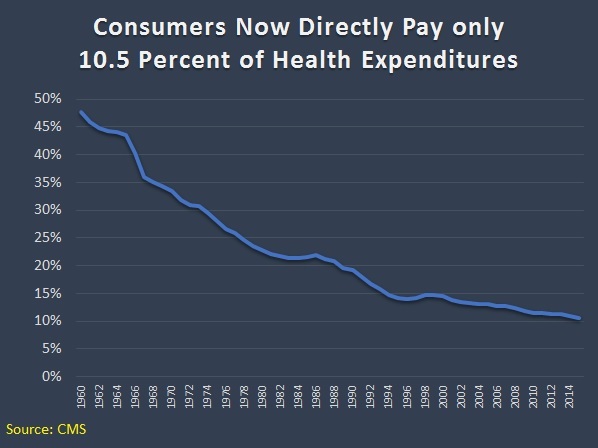 As I wrote yesterday (and have pontificated about on many occasions), the main problem with America’s healthcare system is that various government interventions (Medicare, Medicaid, Obamacare, tax code’s healthcare exclusion, etc) have created a system where people – for all intents and purposes – buy healthcare with other people’s money. And as Milton Friedman wisely observed, that approach (known as “third-party payer”) undermines normal market incentives for lower costs. Indeed, it’s a green light for ever-higher costs, which is exactly what we see in the parts of the healthcare system where government programs or insurance companies pick up most of the tab. For what it’s worth, I’m not overflowing with confidence that the new Obamacare-replacement proposal from Republicans will have much impact on the third-party payer crisis. And it probably doesn’t solve some of the Obamacare-specific warts in the system. If you want to get depressed about those issues, read what Michael Cannon, Philip Klein, and Christopher Jacobs have written about the new GOP plan. But healthcare in America is also a fiscal issue. And if we’re just looking at the impact of the American Health Care Act on the burden of government spending and taxes, I’m a bit more cheerful. The Congressional Budget Office released its official score on the impact of the legislation. Here’s the excerpt that warmed my heart. Outlays would be reduced by $1.2 trillion over the period, and revenues would be reduced by $0.9 trillion. The largest savings would come from reductions in outlays for Medicaid and from the elimination of the Affordable Care Act’s (ACA’s) subsidies for nongroup health insurance. … parts of the legislation would repeal or delay many of the changes the ACA made to the Internal Revenue Code… Those with the largest budgetary effects include: • Repealing the surtax on certain high-income taxpayers’ net investment income; • Repealing the increase in the Hospital Insurance payroll tax rate for certain high-income taxpayers; • Repealing the annual fee on health insurance providers; and • Delaying when the excise tax imposed on some health insurance plans with high premiums would go into effect. And fellow wonks will be interested in this table. By the way, the “two cheers” in the title may be a bit too generous. After all, there should be full reform of Medicare and Medicaid. Though I suppose some of that can happen (at least Medicaid, hopefully) as part of the regular budget process. It’s also unfortunate that Republicans are creating a new refundable tax credit (and when you see the term “refundable tax credit,” that generally is a sneaky euphemism for more government spending that is laundered through the tax code, sort of like the EITC) to replace some of the Obamacare subsidies that are being repealed. So it’s far from ideal. For those who want to see the glass as being half-full rather than half-empty, however, Ryan Ellis has a very upbeat assessment in a column for Forbes. 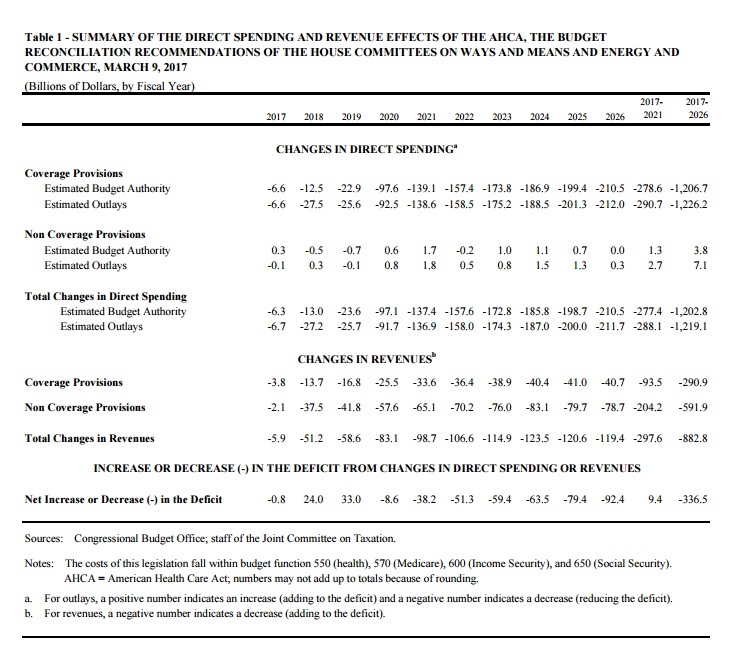 It’s a net spending cut of over $1.2 trillion and a net tax cut of nearly $900 billion over the next decade. …the score shows that the AHCA would be a large and permanent tax cut for families and employers….This should lower the tax revenue baseline considerably, perhaps even by half a percentage point of the economy. I like starving the beast, so I agree this is a good thing. And I also agree with Ryan that the resulting lower tax burden on dividends and capital gains is very positive. After all, double taxation is probably the most pernicious feature of the internal revenue code. The most pro-growth tax cut in the bill is the elimination of the so-called “NIIT” or “net investment income tax.” It adds on a 3.8 percentage point surtax on savers and investors. By eliminating NIIT, the bill cuts the capital gains and dividends tax from 23.8 percent in 2017 to 20 percent in 2018 and beyond. …The contribution limit to HSAs is doubled, from nearly $7000 for families today to $14,000 starting in 2018. But I’ll close with some sad news. If the legislation is approved, that probably means no more Obamacare-related humor. If this makes you sad, you can easily spend about 30 minutes enjoying Obamacare cartoons, videos, and jokes by clicking here, here, here, here, here, here, here, here, here, here, here, here, here, here, here, here, here, here, here, and here. When one is working on shoveling out a giant rubbish heap, you want the whole thing removed with a giant bulldozer, but sometimes the only politically expedient thing is to remove a good chunk at a time. I can’t personally figure out if this is a missed opportunity, good progress towards a broader goal, or perhaps a bit of both.